Rated 5 out of 5 by PnkSongPlaidDnce from Retro Style PC game! My sister and I love this game! It takes a while to win and every time you play, you can make the story end up different! Its so much fun and its a challenge! The animation is done in a very retro 90s game style. If the image was a bit more pixilated, it would totally be like a MC Dos game of the 80s! So I really suggest this game to fellow children of the 80s/90s. You will totally enjoy this blast from gaming days past! We are for sure buying any other games that come out like this! Rated 5 out of 5 by Rosenguard from The detail is in the strategy! There's been a lot of comparing this game to 'Life Quest', which I also bought and completed, they are ridiculously similar in places but, the significant difference is the fact this game is clearly very strategic and in my opinion much more challenging. There's no 'quests', you just climb the 'ladder of success' so you do get to progress and choose your 'life story' which it obviously selects based on the kind of jobs you pick, and education major, as you go along. You have to complete courses which take ages in the last few levels, but you can find 'life cards' to help you halve the time. Its similar to cute knight kingdom in that you are sat there waiting for the time to go by at the end. 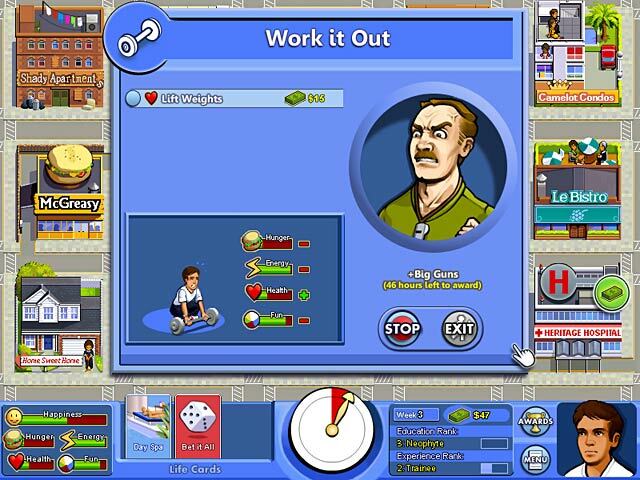 The game has 4 'happiness' meters, unlike the other games in the genre and it has a clock to keep an eye on, so you have to keep her healthy, amused, full up and energetic to keep completing courses and getting work experience. It really makes sense if you like psychology. Theres a lot of stress management science in it, 'Type A' personality and so on, there's also the sense of if you go dancing its fun but wears you out and makes you hungry which sort of makes you unhappy on another level? It means the key to winning the game is achieving balance. (Also learning how to use money carefully and make the most of lifes little rewards - the life cards). It will annoy you senseless if you have little patience, no interest in psychology, a need for great graphics to call a game fun, or a gripping storyline! Leave school, get job start 'proper education' -> find perfect job and go everywhere in the city trying to cheer yourself up as you do! Loads of random events to play about with as you go. I think some board game lovers would like this game because of the air of chance that comes with it and possibly the set up of the main screen. Rated 5 out of 5 by Comfortrox27 from Loved it! This is a fantastic game that I would definitly consider buying! If you like this game some good reccomendations for other games would be Life Quest and Virtual Families. Rated 4 out of 5 by mrm2006 from Work your way up in life. You've graduated from high school and are living in your parents' basement ... so what's next? Well, you get a job, make sure you are healthy, not hungry, have enough energy and have fun, too. You attain these goals by doing various things around town. And, when the weekend hits, you either gain or lose some of those valuable life points. Don't forget to make one of your goals getting your own seedy apartment (it is your first, you know) and continuing your education (necessary to upgrade your job potential). I didn't think I'd enjoy this original version of the game (I played the sequel first, go figure) and it does start off really, really, really slow but once you get the hang of things and figure out the different places you can go to attain your goals, it actually becomes fun. I couldn't wait to finish my next college course and see what new choices of jobs I had available to me. Anyway, I would highly recommend this to all adults (and maybe some high school kids could learn a thing or two - lol). The demo is free and the hour went by way too quickly. Would definitely add to my wish list. Happy Gaming! 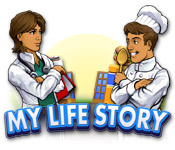 Rated 4 out of 5 by pses from nice simplified virtual life game My Life Story is a simplied virtual life game. At first, when I saw the graphics - very basic, flat simple layout - I thought it would be boring. However, after playing for a little while, I got drawn in to the strategy and time management aspects of it. There are several games of this genre and type - one, in fact, almost a complete copy - but with better graphics. This doesn't take away from the fun of this game -you'll be surprised. Also, it's just you playing, so there are no aggressive competitions to reach a goal before someone else. Nice game! Rated 3 out of 5 by acmoll from Good At First... When I bought this game my first impression was Wow! 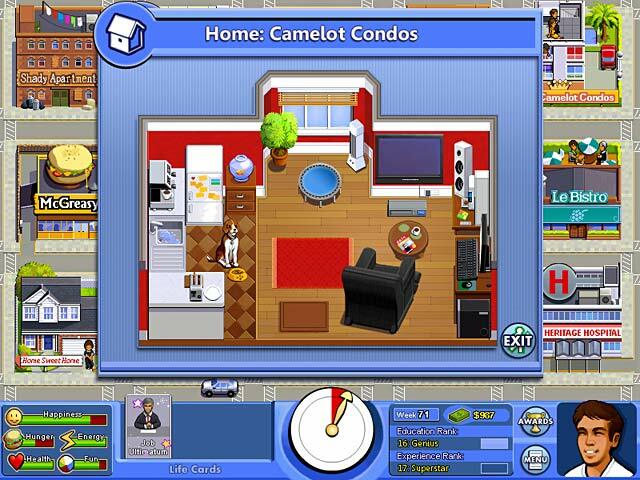 another virtual life game. I'm a big fan of the life quest series and was hoping for a similar experience with this game. I was let down. Fun: This game started out fun but soon got repetitive after working and eating time and time again. you never had a true sense of progression Technically, This game was average meaning decent graphics and elevator type music. standard stuff for a five dollar game. Plot: The story in this game was barely there; a few sentences at the beginning that's it. If you want a game to entertain you for a few hours and enjoy this type of game (Virtual life) buy this one. Rated 3 out of 5 by AllGrownUp26 from It's Just "OK" It's an OK game, it wasn't challenging enough for me. Rated 3 out of 5 by samizdat from Retro Look and Hipster Irony I've played all the life-simulation games on this site (I think) and this was my least-favorite. It's kind of gloomy with a big dose of hipster irony that is sometimes funny, sometimes stupid. 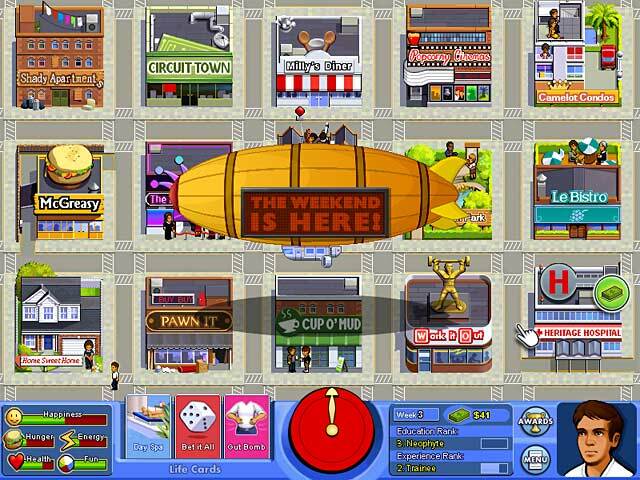 Like other games, you start at as clueless 20 year-old who needs to get a job, pay rent, buy food, go to school, etc. The hipster irony comes in right away - one of your first "job opportunities" is to be a beggar on the street. Your landlord is a creep, the only place to buy stuff is a pawn shop. If you get too hungry or too tired, you get rushed to the hospital and lose half your money in hospital fees. The look of the game also feeds into this vibe. It has an Atari-looking, big-pixel design with jerky motion. I can only assume this was intentional. This game is more repetitive than some others of its genre. There's just less to do - no clothes to buy and very few meal options - and the dreariness gets you down.